From a hidden location Martian Manhunter and Aquaman watch and comment on the current incarnation of the League. Red Tornado lies to his wife about the importance of him going on monitor duty rather than visiting with her mother. Hawkgirl discovers that Roy Harper has a daughter but before she can get upset about him not revealing this fact to her Roy shows up and introduces her to Lian. Black Canary gives Hawkgirl a friendly warning to not hurt Roy. Jefferson Pierce once again trades on Luthor's name to gain information. Vixen tries to reclaim her animal copying powers but finds that she can still only mimic the powers of those around her. Later Red Tornado walks in on Roy and Kendra having an intimate moment. At the same time a lawyer on retainer for Lex Luthor is informed that Jefferson Pierce has once again used Luthor's name proving that he is a lying sack of garbage. 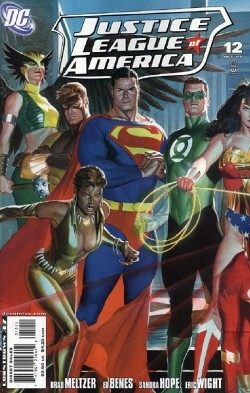 Geo-Force meets with Deathstroke and pretends to side with the villain as Superman, Wonder Woman and Batman watch via a communicator. Green Lantern and Flash reminisce about Barry Allen in the trophy room. Suddenly Green Lantern notices that Felix Faust has finally made his move and calls the red alert. As Manhunter and Aquaman finish their conversation the League assembles and once more bands together to protect humanity. Story - 4: Overall this final issue is indicative of Brad's run on the book. The strength of this story was in the characterization and seeing how the members interact with each other. The flow was very organic and I liked the way we got to see the members over the course of a day as they took monitor duty. It was kind of sad to see Red Tornado's humanity slipping away. I liked the payoff of the flirtations between Roy and Kendra, especially with Meltzer bringing Lian into it. The fact that Lian was dressed in a little Speedy costume was very cute. The exchange between Kendra and Dinah was neat as well and played up the fact the history that Dinah and Roy share. The sub-plot of Jefferson Pierce retaining some street cred with the super-villain community could have been paid off a little better. I thought this was an interesting angle to take with Black Lightning but the fact is that Brad set up something that he may never get the chance to settle. Sure it was ominous to have the lawyer Luthor kept on retainer getting the mysterious phone call, but there is a certain level of frustration that goes with having something presented to you that may never be resolved. I also dug Martian Manhunter and Aquaman talking about the various Leaguers as the day wore on. I didn't know Arthur Curry was back to being Aquaman, but it was nice to see just the same. Their insights were interesting and Meltzer used this little tool to good effect. And that was my biggest problem with this issue. I don't know if Meltzer was setting up a bunch of stories for Dwayne McDuffie to run with or not, but I'm kind of old school in thinking that it's better to see the writer who initiated the threads to be the one that ties them up. It's not the biggest deal in the world and it may be that everything set up here (Kendra and Roy's relationship, Jefferson Pierce drawing the ire of Lex Luthor, Geo-Force playing double agent for the League) will be used by the next administration. Still, it would have been nice to see Meltzer deal with those issues. Don't take that to mean that I'm not looking forward to Dwayne McDuffie on this title. I can't wait. His work on JUSTICE LEAGUE UNLIMITED was phenomenal and his past comic book efforts were always highly entertaining and enjoyable. I am looking forward to his comic book version of the League. So here we are at the end of Meltzer's run. Now is usually the time to reflect and take stock of what has come to pass. It's also time to ask the really hard question. 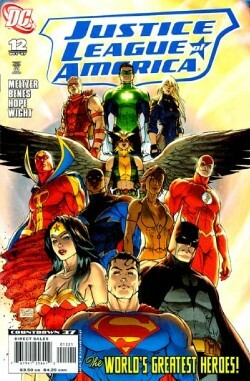 Did I like Meltzer's run on JUSTICE LEAGUE OF AMERICA? On the whole; yes. Looking back on my reviews for this title I see that I have been mainly positive toward Meltzer's run on this book. I stand by those reviews. Overall I have enjoyed the last thirteen issues of this title and feel that Brad has done right by the League. More than anything he has renewed the sense of greatness that the Justice League should have. The team had been floundering in story arc hell for some time and aside from a few bright spots I felt that the Justice League had become a vessel for a rotating cast of creators to tell the League story they always wanted to tell. Meltzer's strength is character and he played with the toys of the League to an entertaining and engaging end. I don't know. I liked it but it felt a bit light. I mean the stories had heft but their pacing and the fact that it took six issues for the League to finally get together hurts the run because once they're up and running we get an issue where the new headquarters is introduced, three issues of a crossover with JUSTICE SOCIETY OF AMERICA, an issue where Roy and Vixen are trapped beneath a building and then a day in the life of the League. Interesting? Yes. Entertaining? Yes. Satisfying? Sort of. I mean it's like eating DiGiorno over going to a really good pizza place. Sure it tastes good. Sure it fills your stomach. Sure it's pizza, but in the end it is just frozen pizza, albeit good frozen pizza. I got the League. I got characterization. I got super heroes banding together to fight the good fight. I just didn't get enough of it. Oh well. I enjoyed the majority of it and that's all that really matters. And, in all honesty, I'd be interested to see Meltzer take another crack at the book. What can I say? I like the way the man writes, just not every single word. Art - 5: Eric Wight's flashbacks were a nice addition to the story. I liked his work from the zero issue and I like it here. It separated those pages from the rest of the story and made it seem like more than a flashback. Kind of retro, but cool nonetheless. Otherwise this was a pretty standard issue for Benes and Hope. I have enjoyed their work thus far and really haven't found anything in this issue that would change that. The page layouts fit the story well and while there were a few moments where it seemed that a panel would be copied for the next beat I think this was done to serve the story. I especially liked the two page spread at the end with the League charging into battle. While I was happy to see that the Alex Ross covers were made into a wallpaper at DC's site I think this would have made a neat one to have as well. 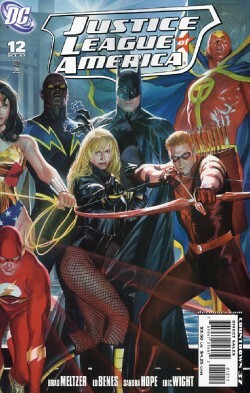 Cover Art - 5: (Standard Covers by Alex Ross) And if I could give it a higher rating I would. These two covers were fantastic when I first saw the preview image and they are fantastic here. Ross is a phenomenal artist and I love just about everything he paints. The metallic sheen on Red Tornado. The speed lines coming off the Flash. The texture work on Hawkgirl's costume. Everything came together just right here. Add that this is the first time I've seen Ross draw Black Canary as an attractive woman instead of some dude dressed as Black Canary and the image is even better. Oh yeah. It's on my desktop. I had to cut the bottom off a little because of my screen resolution, but it still looks freaking sweet. Cover Art Alternate - 5: (Alternate Cover by Michael Turner and Peter Steigerwald) Yeah I said five. It's a little static but even still I thought it was a nice looking cover. I have no complaints whatsoever. Yeah I was surprised too.